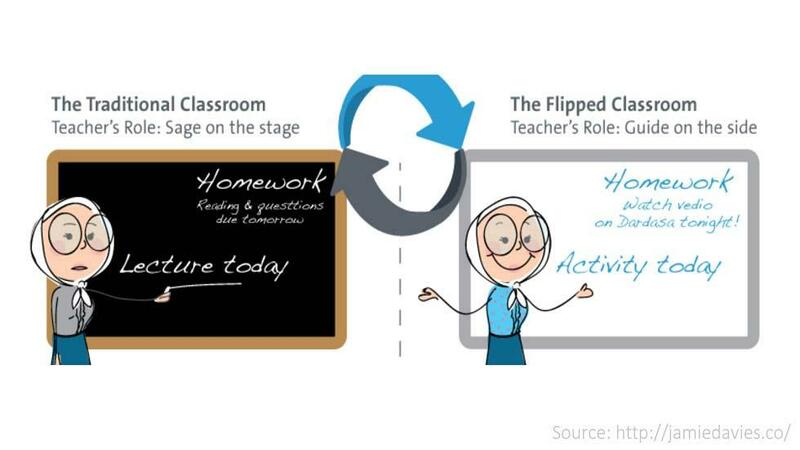 Flipped learning is a blended learning practice that brings interactive engagement in the classroom. It enables students to learn content online, generally at home, and homework in the classroom with the help of teachers. In a flip environment, teacher’s interaction with their students is more personalized and guiding. So that you don't find yourself in isolation, please find below some Twitter, Pinterest, and Facebook accounts to follow and stay updated about flipped learning practices. Flipped Classroom i Danmark: A group dedicated to flip classroom and flip learning. The Flipped Class Network: A professional learning community for teachers using vodcasting in the classroom. Amazing Flips & Tips: Group consist of people that advocate and practice flip learning. Join this group get great flip classroom tips. Flipped Classroom: Another good community for educators who love flipping their classroom. Find out great articles, tips and tools on this page. The Flipped Classroom: Another helpful community page for flip classroom lovers. The Flipped Science Classroom: This page is for educators interested in the "flipped classroom"--the idea that lessons are watched/listened to at home by students, and guided practice. Flipped Learning @flippedlearning: Flipped Learning Network offers educators with skills, knowledge, and resources to effectively implement Flipped Learning. Kristin Daniels @kadaniels: Follow Kristin - an education consultant coach, presenter, and author. You can follow her account for great flipped learning tools and tips. Cheryl Morris @guster4lovers: Cheryl is a flip class teacher and EduBlogger. Sophia.org @sophia: This a account of official twitter account of sophia.org that offers several free tutorials for flip classroom. Crystal Kirch @crystalkirch: Crystal is aflipclass advocate. Craig Yen @craigyen: Craig is a 5th grade flip classroom teacher of Maths. Flipped Classroom by Annachiara Piffari: A pinterest board full of resources with flip learning. Blended Learning / Flipped Classrooms by Susan Pojer: Pinterestboardwith blended learning and flipped classrooms. FACS - Flipped Classroom by Cindi Walls: Important flipped classroom resources in the form of articles, videos, infographic and much more. Blended Learning & the Flipped Classroom: Resources for blended learning and the flipped classroom. Flipping the Classroom: Resources to inspire educators to think differently about their teaching. Flipping the Classroom: by Michelle Behnfeldt: Videos, articles, links and many more resources to flip classroom. Flipped Learning: Videos of Aaron Sams and Jonathan Bergmann. They are a mix of videos they have done or been done about them regarding the flipped classroom model. Also contained on this channel are the videos they produced for their students while they were science teachers at Woodland Park high School, Woodland Park, CO. The Flipped Classroom by Joe Hirsch: The video archive for a flipped classroom. Mr Douglas' GCSE Biology Flipped Learning and Revision Videos: This channel was set up by Mr Douglas to put up his flipped learning videos. These videos are also designed to be used to support revision of key topics. They are designed for the Edexcel GCSE (2011) spec but are probably of use to most GCSE Science courses. MrHammysMathClass: These videos are for Geometry students at Red Lion Christian Academy. The videos are recorded by Mr. Hammy at home using Adobe Illustrator, Camtasia Studios recording software and a graphics tablet. The videos are part of the "flipped classroom." The students view the videos at home instead of doing homework. In class the next day they work together with other students and with Mr. Hammy walking around helping them with problems that they do in class. The concept of the flipped classroom or learning has been swept the education community. The idea is not complex, but it is most surely a withdrawal of traditional way of teaching. Students learn and read content at home using many tools and videos offered by educators. It’s a very creative and amazing concept and these pages and accounts will help you to implement it perfectly in your classroom. Khan Academy is Looking for India Country Manager: Are you Interested?